When Michael Hernandez de Luna organized this show and the variety, depth and explicitness of the images began to present themselves, I asked him if there could be an image that he would not show- if asked by a venue to remove it- he would. He assured me that nothing submitted would ever be banned or excluded. To test his integrity I created this piece. 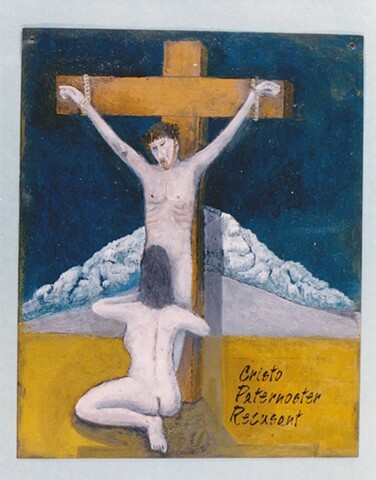 When the show was taken to Houston for an exhibition, it was subjected a scathing reception; there were threats, the windows of the gallery were covered with a black curtain and the Catholic League denounced this piece "as the most disgusting ever made". Hernandez took down my piece.